I was compensated for this post and video. Affiliate links are included and will pay me a small commission if purchases are made from these links. These are very easy to make and inexpensive. All one needs to do is fill the jar with candy. Tie a ribbon bow to the top. Make many and give! Make a lot of people happy, or decorate your tree with a dozen of these! Fill them with anything! They are fun, original, and will bring a smile to everyone. 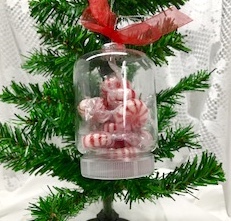 Look for many other Holiday DIY's, and ideas on Christmas at the Tree on DollarTree.com. Enjoy the holidays! Happy Crafting.